Warmer temperatures and lack of snow in parts of North America are setting the stage for what could be a most intriguing 15th annual Great Backyard Bird Count, coming up February 17-20. Bird watchers across the U.S. and Canada are getting ready to tally millions of birds in the annual count coordinated by the Cornell Lab of Ornithology, Audubon, and Canadian partner Bird Studies Canada. In the past, participants were most likely to report American Robins in areas without snow. Will more robins be seen farther north this year? Will some birds, such as Eastern Phoebes, begin their migrations early? And where will the Harry Potter  owl turn up next? 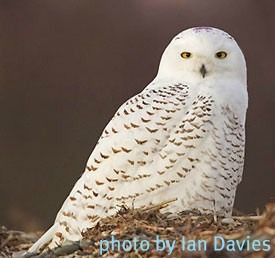 Snowy Owls have dazzled spectators as these Arctic birds have ventured south in unusual numbers this winter–an unpredictable occurrence that experts believe is related more to the availability of food than to weather. She Is Dallas Info: The Great Backyard Bird Count is an annual four-day event that engages bird watchers of all ages in counting birds to create a real-time snapshot of where the birds are across the continent. Anyone can participate, from beginning bird watchers to experts. It takes as little as 15 minutes on one day, or you can count for as long as you like each day of the event. It's free, fun, and easy ”and it helps the birds. The Great Backyard Bird Count will take place from Friday, February 17, 2012 to Monday, February 20, 2012. To learn more about how to join the count, get bird ID tips, downloadable instructions, a how-to video, past results, and more visit www.birdcount.org. The count also includes a photo contest and a prize drawing for participants who enter at least one bird checklist online. You can also join the Great Backyard Bird Count on Facebook. Here are some great local events celebrating The Great Backyard Bird Count. River Legacy Living Science Center, 703 NW Green Oaks Blvd., Arlington, TX. Saturday, February 18, 10:00 am – 2:00 pm. Participate in the Great Backyard Bird Count and enjoy fun family activities such as an 8:30 am Early Morning Bird Walk, see Forest the Squirrel at 10:00, Family Bird Walks and Group Counts at 10:15/12:00/1:00, Story Time at 11:00, Guided Bird Walk for Adults at 11:00. Ongoing activities throughout the day include Bird Valentines, Just Ducky, Nesting Bags, Owl Pellets, Avian Art, Bird Silhouettes, Face Painting, Migration Challenge, Fill the Bill, Birding Lane, Bird Friend or Foe, Bird Counting, and Eggzamine Eggs. Admission is free but donations are accepted. For more information, please call 817-860-6752 or visit the River Legacy Living Science Center webpage. Trinity River Audubon Center, 6500 Great Trinity Forest Way; Dallas, TX 75217. The Great Backyard Bird Count event will take place on Saturday, February 18, 2012 from 9:00 am – 2:00 pm. Join our experienced North Texas field ornithologists in this Citizen Science adventure for all ages. A 15-minute bird census will be conducted at various locations on the TRAC property every hour on the hour. All findings will be submitted to GBBC. This event is free. For more information, please call 214-398-8722 visit the Trinity River Audubon Center webpage. Dogwood Canyon Audubon Center, 1206 W. FM 1382 Cedar Hill, TX. The Great Backyard Bird Count event will take place on Sunday February 19, 2012 from 9:00 am “ 2:00 pm. Bird watchers of all ages and skill levels are invited to join us for the 14th Annual Great Backyard Bird Count! A 15-minute bird census will be conducted at various locations on the DCAC property every hour on the hour. All findings will be submitted to GBBC. For more information, please call 469-526-1980 or visit the Dogwood Canyon Audubon Center webpage. My kids and I love bird watching and the Great Backyard Bird Count is a great way to help them learn to identify birds and it is for a good cause. I hope to see you at one of these great local events!